The hook shot is a very useful and high percentage close range shot, most often used by big men in and around the basket. It begins with your back to the basket while someone is guarding you in the post up position. 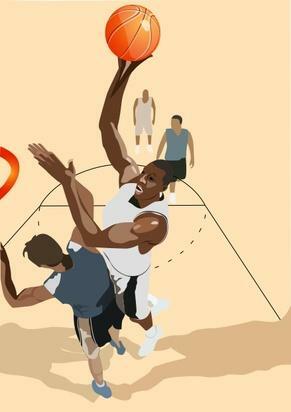 You turn so your body is perpendicular to your defender and raise the ball high with your far hand… jump up and softly roll the ball off your fingertips as you’re going up. This is also known as a Jump Hook. Another variation is the Sky Hook. This is a shot made famous by Kareem Abdul Jabbar of the 80's Lakers teams. Instead of jumping straight up and raising the ball upwards, you're releasing with more of a circular arc motion with your left shoulder (on a right-handed shot) digging down into the defender. Your shooting arm carries the ball and begins at waist level and swoops upwards. Just imagine during the shot, that you're keeping the ball as far away from the defender as possible and release at the apex of your ascent.